Jared Wagner didn’t wait until Spring Grove inbounded the ball with less than three seconds on the clock to start celebrating Tuesday night. The senior ran toward the Central York student section – his teammates eventually following suit – and jumped onto the boards that separated the stands from the court, raising his arm in the air triumphantly. It was a visible display of emotion from a player who has used that fire all season to help the Panthers reach the District 3 Class AAAA championship game. That emotion, though, has made Wagner a polarizing figure among some opposing fan bases. Early in Tuesday's semifinal against Spring Grove, Wagner hit a 3-pointer and followed it with a celebratory motion. The Spring Grove fans voiced their displeasure. He hit another shot from beyond the arc in the second quarter, turned around and made his way up the court with his arm in the air. Again, it didn't sit well with opposing fans. And this time, the official told Wagner, "That's enough," as he ran down the court. For better or Worse, Wagner is a passionate basketball player and he brings that to the court night in and night out. Not everyone in the crowd may be a fan of Wagner's display, but that doesn't dissuade him from leaving it all on the floor. 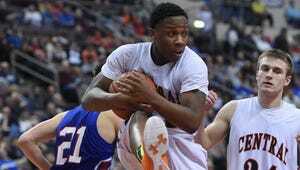 Whether he is over the top or a player who puts it all on the line, Wagner has been Central's best player. Offensively he has found ways to put points on the board, scoring a team-leading 19 points per games, or on the defensive end where he's often tasked with guarding the opposing team's best players. Central coach Kevin Schieler has said Wagner's emotions have been a catalyst for the Panthers' success all season. Schieler even went as far as saying Wagner’s energy “is our team’s energy.” It was a sentiment that Onterio Edmonds echoed as well. But Schieler is also aware of how others view Wagner's behavior. “He’s competitive,” Schieler said. “I’ve told people all year long he’s the most competitive person I’ve ever been around, and I think that’s why he gets so emotional. I don’t think it’s showboating to opposing fans. I think it’s for our crowd. … He just plays with such heart and leaves it right out there on his sleeve. Wagner has seen his share of criticism on social media and has heard some critique during games, but Schieler was quick to point out all the positive things Wagner does away from the court, including putting in time with youth players and his involvement in other school activities. "He's such a tremendous young man," Schieler said. "What he does for us on the basketball court is great, but what he's like in the school and in the community is even better."